FORT PIERCE — State Attorney Bruce Colton said Friday his office has not been in communication with federal prosecutors about possibly moving the case of accused mosque arsonist Joseph Schreiber into federal court. Schreiber, 32, was arrested Wednesday by St. Lucie County Sheriff’s officials on two felony state level charges in connection with the fire at the Islamic Center of Fort Pierce that began around midnight Sunday. Colton said based on Schreiber’s criminal history and the charges on which he’s been arrested, he could face life in prison in the state system. “I don’t know what he could receive in the federal system, but if they have a special interest in prosecuting this case that would be fine with me,” Colton said. Schreiber has an arrest history dating to April 2003. Many of the arrests relate to relatively minor crimes, such as shoplifting, trespassing, battery, probation violation and larceny, according to Florida Department of Law Enforcement records. He was arrested in April 2010 by the Martin County Sheriff’s Office on a robbery with a weapon charge. All of his arrests were made by agencies in Martin and St. Lucie counties. No one answered the door Friday at Schreiber’s listed address in Port St. Lucie off Northwest East Torino Parkway just west of Florida’s Turnpike. The listed owner of the home is Arthur Schreiber, according to property appraiser's records accessed online. FDLE incident reports indicate Arthur Schreiber is Joseph Schreiber's father. Colton said typically prosecutors have 21 days to make a filing decision. He said a decision hasn’t been made because Schreiber was arrested recently, and Assistant State Attorney Linda Baldree is reviewing the case. Federal agencies, including the Bureau of Alcohol, Tobacco, Firearms and Explosives, are investigating the case, according to the U.S. Attorney’s Office. He said that conversation hasn’t taken place yet. “We’ll go forward as though we’re prosecuting the case and, if at any point they determine that they would like the case and we agree that they should have the case, we can drop our charges or hold our charges in abeyance until they complete theirs,” Colton said. Schreiber told investigators he didn’t mean to hurt anyone “and was embarrassed for having committed the crime,” according to his arrest affidavit. Sheriff's investigators said they believe he acted alone, but are investigating if there may be an accomplice. Schreiber also “made remarks indicative of prejudicial rhetoric associated to Islamic extremists,” according to his arrest report. The mosque is where Omar Mateen worshiped. Mateen is the gunman from Fort Pierce who killed 49 people June 12 at an Orlando gay nightclub. Law enforcement officials shot and killed Mateen. 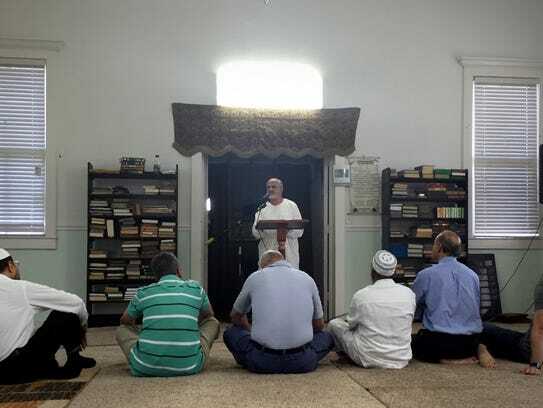 Meanwhile, worshippers attended prayers Friday at the Islamic center on West Midway Road. As of Friday afternoon, a LaunchGood campaign has raised more than $32,000 of a $50,000 goal for the Islamic Center. Schreiber was held Friday in the St. Lucie County jail on no bond, a jail official said.